"There's a slice of holiday fun for everyone. Scoop up the wintertime goodness and fill your plate with merry." Meanwhile, place ice cream in refrigerator for about 15 minutes to soften. Scoop ice cream into crust and spread evenly with spatula. Pipe or spoon whipped topping around border of pie. 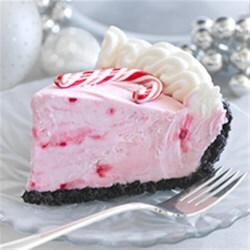 Arrange small candy canes on top of pie. Place pie in freezer for several hours or until ice cream is firm. To serve, cut pie into 8 wedges. Place each wedge on a dessert plate and drizzle with chocolate syrup or hot fudge sauce, if desired. *Store-bought chocolate cookie crust may be substituted.